It’s been 75 years since the 43rd Bomb Group began the long journey to Australia and the Pacific Theater. Today, we’re revisiting the first part of that journey, which we originally published on Sept. 26, 2014. For nine years, the Queen Mary was a luxury passenger liner that had been commissioned by the British Cunard Line. August 30, 1939 marked its final peacetime cruise across the Atlantic, and as per request by Winston Churchill, it would be retrofitted and used as a troop ship for the next few years. While Gen. George C. Marshall was hesitant to accept Churchill’s offer, Gen. Dwight D. Eisenhower knew the Pacific theater was in dire need of additional troops. Since this would be the fastest and most efficient way to send additional men, Eisenhower ordered to proceed with Churchill’s idea. The ship went from carrying approximately 2000 passengers in peacetime to around 16,000 troops, the size of an entire army division. Because of its speed and passenger capacity, Hitler supposedly put a $250,000 bounty on sinking this integral part of the Allied troop transport system. Early on February 17, 1942, the 43rd Bomb Group boarded a troop train at their base in Bangor, Maine for a destination that was still unknown to them. After riding for nine hours, the men arrived at the Port of Embarkment at Boston Harbor, where they would board the Queen Mary. They spent a cold night on the ship, then watched the US coastline fade into the distance at noon on the 18th. There was no public send-off because the ship needed to leave in secret so it could avoid being targeted by German U-boats. Still, a small crowd had converged on the dock to wave goodbye–a comfort for the men and a concern for the ship’s captain about how long their journey would stay secret. One of the three largest passenger liners in the world, the Queen Mary was a luxury ship during peacetime, as seen here. After refitting, she was capable of carrying as many as 15,000 troops in a single voyage, making her crucial to the war effort. Her importance to the Allies was so great that Hitler reportedly offered a $250,000 bounty to any naval captain who could sink the gigantic ship. By the end of the war, the Queen Mary had carried a total of 765,429 military personnel over a distance of nearly 570,000 miles. The Queen Mary was escorted by two destroyers at first, but sailed too quickly for the WWI-era destroyers to keep up, and soon left them behind to sail south alone. Meanwhile, then men on board hadn’t been told of their destination and began wondering where they would be going. The ship sailed by the eastern Florida cost, then reversed its course and dropped anchor near Key West, Florida. Two tankers quickly refueled the ship, which was guarded by six sub-chasers and a flying boat during the process. Originally, the vessel was going to stop for fuel in Trinidad, but a submarine was seen lurking in the waters. It was rumored that a U-boat sank the tanker that would have refueled the Queen Mary. Life aboard the Queen Mary wasn’t too bad for the 43rd. Since the unit wasn’t full of draftees going through basic training, most of the men lived on the B deck, which was only two floors below the open-air main deck. Their rooms comfortably held nine men each, who enjoyed sleeping on deep, inner spring mattresses. The only downside was needing to keep the portholes closed at night, keeping the rooms hot and stuffy. Soon, the quality of food became an issue for the men. The ship’s British crew served the men meals consisting of kidneys or mutton stew–foods to which the Americans were not accustomed. The complaints were addressed on March 2nd during an officer’s meeting and the Americans were happy to find roast beef, macaroni, bread and jam, and coffee at lunch that day. The men were also introduced to the British custom of afternoon tea and went from being puzzled to gladly adopting the tradition. A typical day on the ship was spent doing calisthenics for an hour in the morning on the sun deck, weapons classes and inspections, as well as fire and boat drills. The guns were fired every day, both as practice and to get the men used to the noise. Free time was spent watching movies or live shows, exercising in one of the Queen Mary‘s two pools, playing poker, and attending religious services. The ship traveled from Boston to the tropics in less than a week. With the heat of their tropical location, sleeping in the cabins became extremely uncomfortable and difficult. 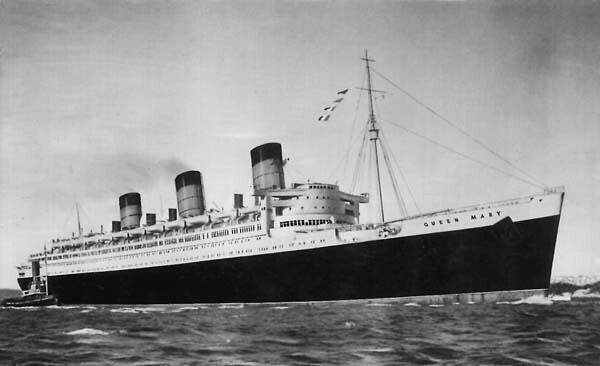 On March 1st, the Queen Mary steamed southeast and rumors of a stop at Rio De Janeiro began to fly. About two weeks after leaving the late winter weather behind in Boston, the Queen Mary stopped in the tropical city of Rio De Janeiro on March 6, 1942. While the men weren’t allowed to leave the ship, they were quite content to take in the view of the city surrounded by lush, green mountains and the famous statue of Christ the Redeemer. “…A symbol of peace in a world torn by war,” remarked PFC. Ducharme. The ship’s appearance in the harbor didn’t go unnoticed by the Axis. Messages from Nazi radio installations and an Italian spy ring were sent off containing information about the Queen Mary‘s course, position and time of sailing. After supplies were loaded and the ship was refueled, the Queen Mary set sail on March 8th, heading for Cape Town, South Africa. Josef Jacob Johannes Starzicny was arrested by Sao Paulo police on the 10th for sending the message to the Nazis. Eventually, an Axis spy ring was also disrupted by the Brazilian police and American Special Intelligence Service agents. The occupants aboard the ship experienced nothing more than rough seas on this leg of the journey. A portion of the men had their first bout with seasickness as they sailed through waves that sometimes topped 30 feet. Six days after leaving Rio, the Queen Mary steamed into Cape Town’s harbor. The city’s backdrop of black cliffs were a stark contrast from the green mountains that the men had seen at their last stop. Men were told that there wouldn’t be any shore leave this time either, leaving them feeling more restless and anxious than before. Once again, the ship was restocked and on its way by March 15th. Soon, the troops were told they would stop in Fremantle, Australia, then disembark in Sydney. Before they could reach Australia, they had to cross the “Roaring 40s,” a rough patch of sea with waves rocking the ship hard enough to send people flying from their chairs and dishes from tables and leaving more of the troops seasick. Three small fires broke out in different parts of the ship on March 22nd, making everyone aboard very nervous. Finally, the Queen Mary reached Fremantle the next day for refueling and resupplying, then sailed on to Sydney on the 24th. The last part of their voyage was difficult as well. Temperatures hovered around freezing and the water was the most turbulent that they had encountered on the trip. The troops were briefed on the Japanese military and warned about potential air or sea attacks. On the 27th, the men were greeted with the welcome sight of two destroyers coming out to meet the Queen Mary. They packed their bags, then celebrated the end of the voyage on the prom deck. 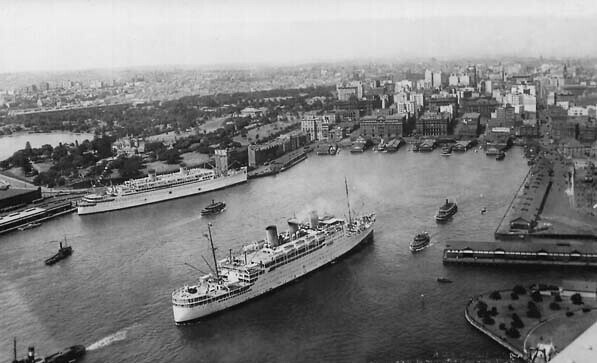 The next day, the ship anchored outside the harbor, as it was too tall to clear Sydney’s Harbor Bridge. Soon enough, the men left the ship and headed out in the rainy weather to their quarters at Randwick racetrack.